How Important Is Your Hotel Brand Name? Before we get started, here’s the answer: your brand name is really important. It’s key to your profit-driven marketing strategy. Here’s why. There is an ongoing debate in the hospitality industry. Should hotels should bid on their own brand name when they run PPC campaigns? While many hotels have seen the benefits and bought into the idea of bidding on branded terms as a defensive strategy against OTAs, there are still many hoteliers who question the need to bid on their brand name. The question should not be whether to bid on your brand; it should be whether you can afford not to! A recent study from Bing Ads focuses on this topic for the travel sector. It suggests that without ads, the organic listing receives 61% of available clicks and the volume of clicks increased by 27% when brand ads were present. While having a brand ad present does cannibalize some of the clicks the organic listing would have received anyway, if no brand ad is present, competitors receive 40% clicks versus only 12% with the ad present. Brand names help build trust. Looking at Net Affinity’s clients on Google, which holds a market share of over 90% of searches across our clients, the numbers look a bit more sinister. When no brand ad is present, organic listings receive 30 – 40% of available clicks, with 60 – 70% of clicks going to other organic listings or paid ads by the OTAs. However, with a brand ad present, hotels are able to capture 60 – 70% of available clicks. So branded ads are pretty important. How do you make sure you get the most out of your branded ad campaigns? A shift in mindset is needed. You need to fundamentally change the way you look at your marketing expenditure. Most hotels consider digital marketing spend on brand to be a cost center. This means they are assigning fixed monthly budgets to their campaigns, potentially restricting their impression share due to budget constraints and reducing flexibility for high demand periods. Essentially, they’re turning the tap off when the money is flowing. They’re acquiring business at a lower cost per acquisition (CPA) percentage than they can through certain other channels, but still have a fixed budget. Implementing a profit-driven strategy changes the way you look at your marketing spend. It should be considered a profit center and used to drive as much profit as possible. Let’s take a look at an example. In red, a client uses a profit-driven strategy whose impressions closely resemble the demand curve. In blue, a client on a fixed budget whose impression share varies wildly and is completely disparate to the demand curve. Looking Closer: Do You Have the Right KPIs? In order to get the most out of your marketing spend, you need to look at the right KPIs. This will allow you to make meaningful decisions and put you on the path to profit-driven marketing campaigns. Most importantly, look at your CPA (cost per acquisition) as a percentage figure. With OTA commissions starting from 15% upwards, your brand campaign should perform to a CPA below that including your booking engine commission. For example, if your booking engine commission is 3%, your brand campaign should ideally come in at 12% CPA or less, and you should keep spending on this campaign with no budget restrictions as long as the CPA is maintained at or below this level. Don’t shut yourself off from a channel that’s bringing in guests at a lower CPA %. Once your brand campaigns are performing at optimal levels with a profit-driven marketing approach, why limit yourself to brand campaigns? According to Google’s 2014 Travel Study, the average travel planning journey includes 21.6 touchpoints on multiple devices. 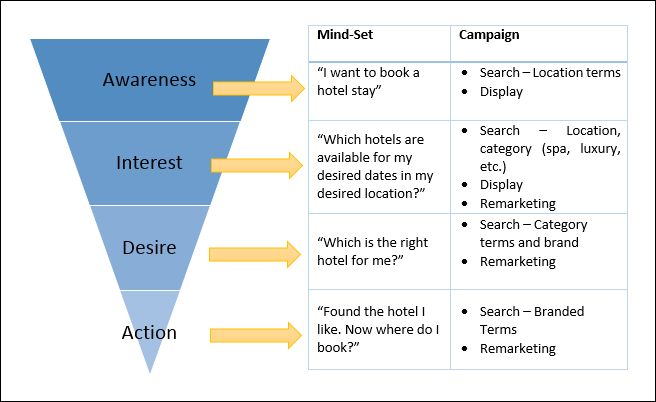 It is crucial for your hotel’s growth to be present at as many of these touchpoints as possible, and paid search campaigns can help you in various stages of the purchase funnel. It is critical for your property to run paid brand campaigns. You could be missing out on 60 – 70% of clicks for brand name searches without branded ads. Shift from a fixed budget to profit-driven marketing campaigns, focusing on CPA as a percentage rather than the total spend per month which could be detrimental to the campaign’s performance. Don’t limit yourself to brand only campaigns. Travel shoppers look at over 20 sites before making a purchase. Make sure you are present wherever possible at all stages of the funnel! Christiane Foller is a Conversion Optimisation Specialist and Head of the Net Affinity Conversion Team. Christiane trained in Austria, Switzerland and in the US before taking on various management roles in Ireland, including General Manager at the Hampton Hotel Dublin. She has a keen interest in revenue and conversion optimization. As the head of the Net Affinity Conversion Team, she leads conversion projects, refining and polishing booking processes and user journeys. Christiane is also a master baker, and has a strong dislike for Universal's yellow Minions.